Delight your online customers with awesome, personal support. Install the Chrome extension to connect Breeze to Groove. 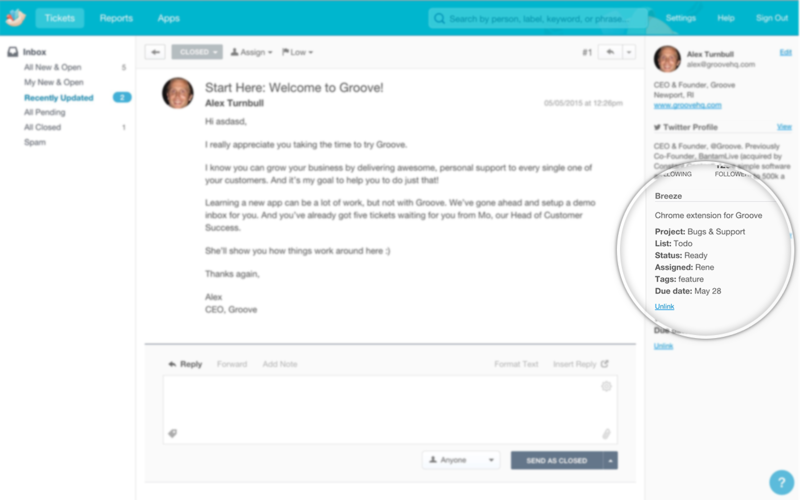 You can link all your Groove support tickets to Breeze tasks with a single click. See all the relevant developemnt information right on the Groove sidebar. Cicking on it will take you to that task in Breeze, so you can see all the other information and discussions. Work together seamlessly and always know what’s going on. See how your customers feel about the support they get from your team members with daily, weekly, monthly and yearly breakdowns of satisfaction ratings. See which complaints, bug reports and feature requests are trending among your customers.